This is the first episode of 2018 and before we jump in I just want to say thank you so much for listening to this podcast and for all of your support. I’ve been doing this for about a year now and the momentum is building thanks to you. So thank you again for your comments, encouragement, and for sharing this show. This is one of the things that I always wanted to do to give back to you guys to show you that you can be profitable and successful in this industry. I never planned a budget or a schedule for this podcast, I just did it. This show excites me, inspires me, and allows me to connect with you guys in a way that I didn’t think that was possible. So thank you again for following me on this journey. Today I’ve invited Matt Gersper onto the show. He’ll be talking to us about beliefs, financial freedom, and living the life that we want to. I felt that it was important to talk about this today because I always hear people stressing about results and getting stuck in a place of survival, which is often caused by fear. People can feel that fear when you’re trying to push things onto your clients and I want you to work from a place of service instead. Service is when we care more about the outcome of our patients than we do the outcome for ourselves. It’s more important to have happy, satisfied clients with conversion rates and increased traffic. Entrepreneurship is never easy, but I want to help you live the life that you want to live. You talk about people feeling a need to be significant, why do you think that is? What is a belief roadmap? How do you identify which beliefs don’t work for you and how do you get rid of them? What can someone do to block negativity coming from other people? What it means to do something from a place of survival vs. a place of service. How to practice reflection within your life. Why people tend to blame external forces and situations. The importance of having something you want to do, every day. Matt’s top tips for building wealth. 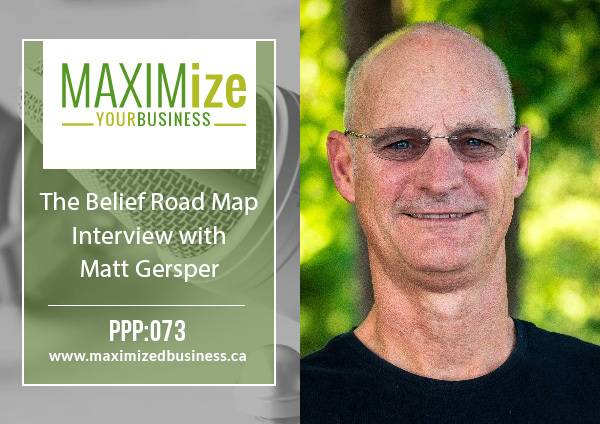 Get a Free copy of Matt’s Belief Roadmap HERE!